4	stars -	"Review for Softlite Soft Fish 5 ft 2 inches" Mark Taylor This Softlite Soft Fish 5 ft 2 inches is the best Softlite I have tried. Short wide=fun in the whitewater and small stuff. Lots of stability, quad set up slidy skatey feel surfboard. The Softlite Classic is ideal for for a fun and safe introduction for both kids and adults learning the skill of surfing with it's softer PE Deck skin. 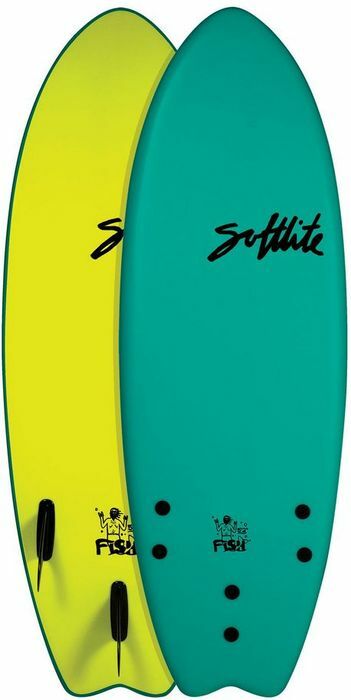 The Softlite Classic has been designed by professional surfers and are fully handshaped templates. ADDITIONAL FEATURES: Edge Trim system, exoskeletal strength membrane, Thruster Fin Set Up, Nyflex nylon screws to screw fins in. Comes with 3 pack of removable, stiff screw in fins and buckle for attaching leash.